Claude Shannon, a renowned mathematician formerly of Bell Laboratories and MIT, was also a juggling enthusiast. He derived a juggling formula based on five variables of juggling: Number of Balls, Number of Hands, Flight Time, Empty Time and Dwell Time. The equation, b/h=(d+f)/(d+e), is printed across the center of the shirt without an explanation. 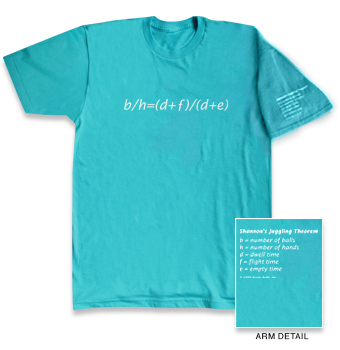 “Shannon’s Juggling Theorem” and the variables defined are printed on the left sleeve of the shirt. An in-depth explanation sheet of the theorem is included with each shirt. All shirts are 100% cotton. #2102 Shannon’s Theorem T-Shirt $15.00 ea.